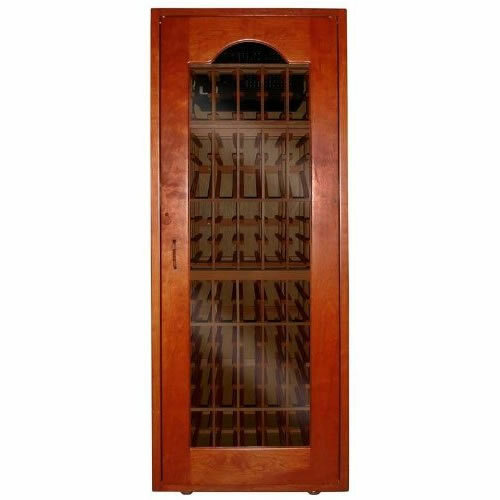 Both dependable and dynamic, the VinoCellier Glass Door Wine Cabinet (VT-CAVESG) is perfect for those who are serious about aging and preserving their wine collection. 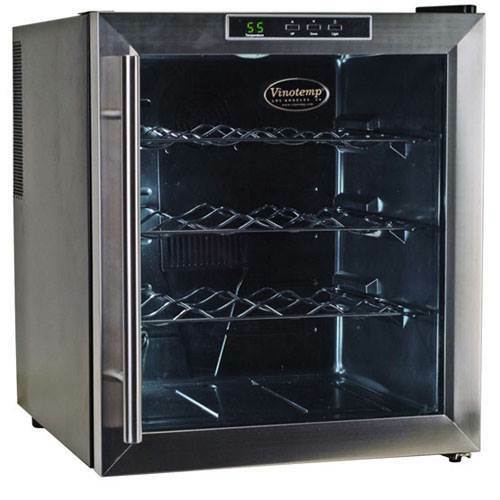 This cabinet is heavily insulated, has an ambient temperature range of 32-86 degreeF and has a built-in hygrometer to gauge humidity, ensuring your wine's conservation even when placed in a garage or basement, but the quiet, compressor-based cooling system makes it so that you can place the cabinet inside, as well. 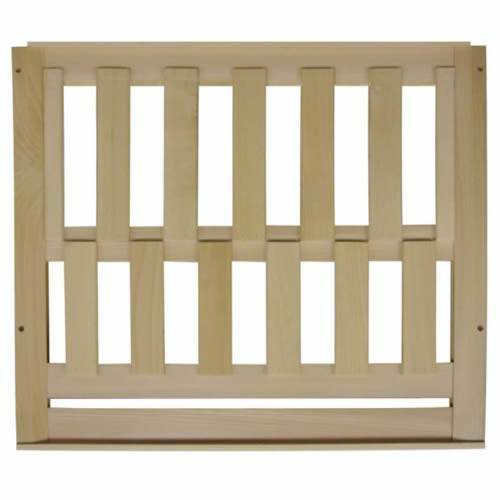 This unit can hold approximately 267 bottles of wine, and the five (5) included wooden shelves are adjustable and can be positioned in three (3) different ways: either to slide out, for bulk storage, or as an attractive display. This cabinet has an adjustable temperature control with digital display, and a controller built in to the roof, making it so that you can hide or display it. Although this cabinet only comes with five (5) shelves, it can hold up to thirteen. Wide Ambient Temperature Range: This cabinet's ambient temperature range of 32-86 degreeF make it so that you can confidently store your wine in a garage or basement 267-Bottle Capacity: This cabinet can hold approximately 267 bottles of wine Built-In Hygrometer: A built-in hygrometer makes it so that you can easily gauge humidity Please Note: This item is delivered using White Glove Service. 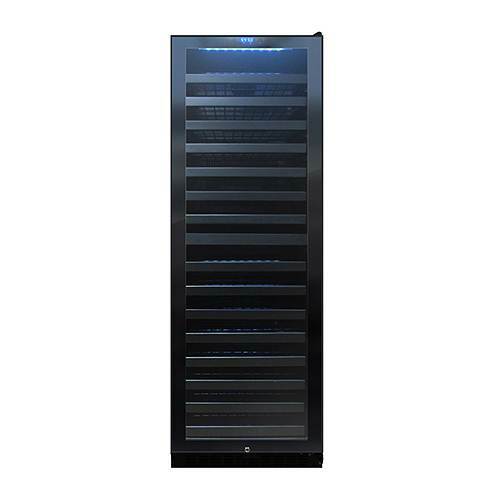 Both dependable and dynamic, the VinoCellier Solid Door Wine Cabinet (VT-CAVESD1) is perfect for those who are serious about aging and preserving their wine collection. 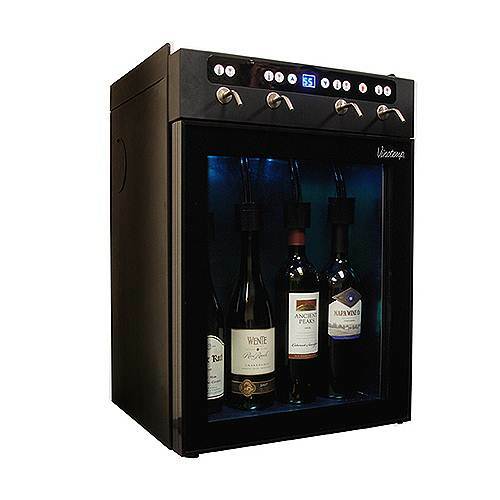 This cabinet is heavily insulated, has an ambient temperature range of 32-95 degreeF and has a built-in hygrometer to gauge humidity, ensuring your wine's conservation even when placed in a garage or basement, but the quiet, compressor-based cooling system makes it so that you can place the cabinet inside, as well. This unit can hold approximately 267 bottles of wine, and the five (5) included wooden shelves are adjustable and can be positioned in three (3) different ways: either to slide out, for bulk storage, or as an attractive display. This cabinet has an adjustable temperature control with digital display, and a controller placed on the outside, making it so that you can adjust the temperature without opening the door. Although this cabinet only comes with five (5) shelves, it can hold up to thirteen. Wide Ambient Temperature Range: This cabinet's ambient temperature range of 32-95 degreeF make it so that you can confidently store your wine in a garage or basement 267-Bottle Capacity: This cabinet can hold approximately 267 bottles of wine Built-In Hygrometer: A built-in hygrometer makes it so that you can easily gauge humidity Please Note: This item is delivered using White Glove Service. 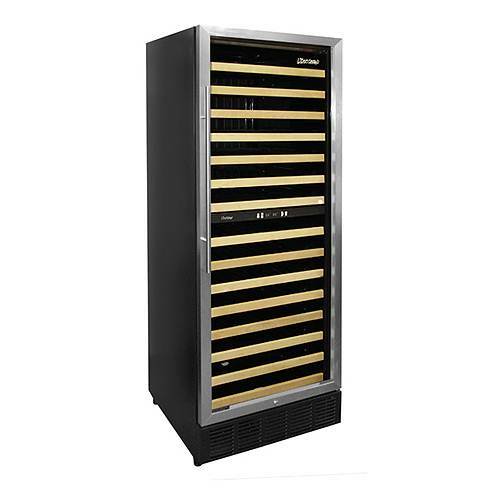 The Vinotemp 12 Bottle I-Cellar Wine Cooler (model: VT12TEDI) meets both form and function. The Vinotemp VT-12TEDI wine cooler features an innovative new design paired with Vinotemp's reliable wine cooler technology. This unit holds up to 12 bottles. Also because of its thermo-electric cooling system, which involves very few moving parts, your wine will be protected from unnecessary vibration. Thermo-electric cooling is not only good for your valuable wine collection but also for the environment. Using absolutely no ozone depleting chemicals such as CFC's or HCFC's you will be sure that you are doing your part to preserve the environment. 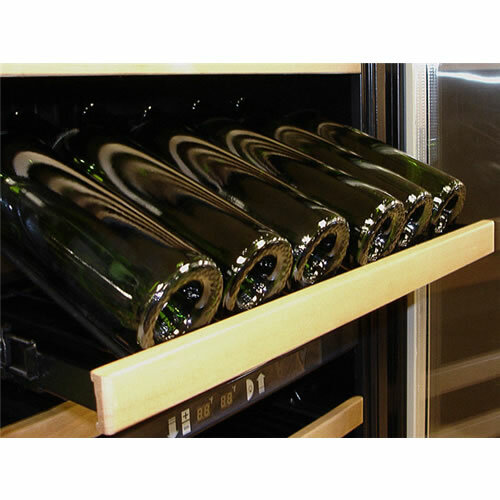 Four slide-out chrome shelves provide easy access to your bottle of choice while preventing the agitation of sediments in other aging wines while an angled bottom shelf presents your favorite varietals. 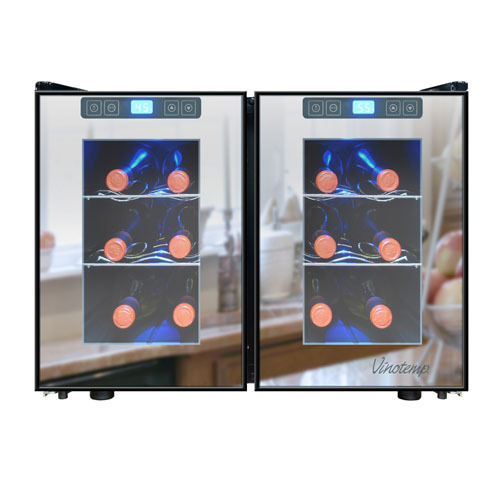 A touch digital control offers settings for red, white or sparkling wine, while the one-touch dual function electronic displays ease temperature monitoring. 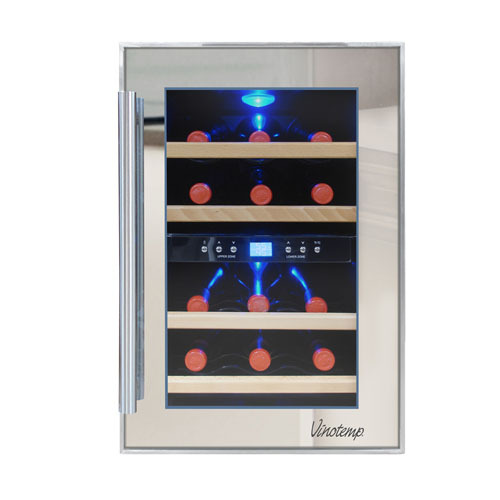 In addition, this wine cooler features auto defrost, interior light, and mirrored glass door with stainless steel trim. 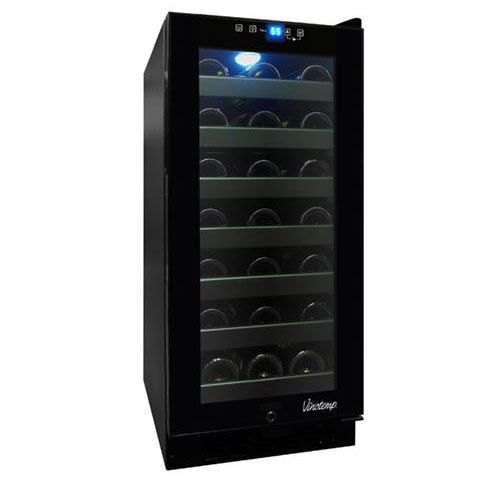 The VT-12TEDI wine cooling unit uses dual paned glass windows, a technology that has been proven in the construction industry. They have better insulation properties, better UV protection, and are easier to clean. 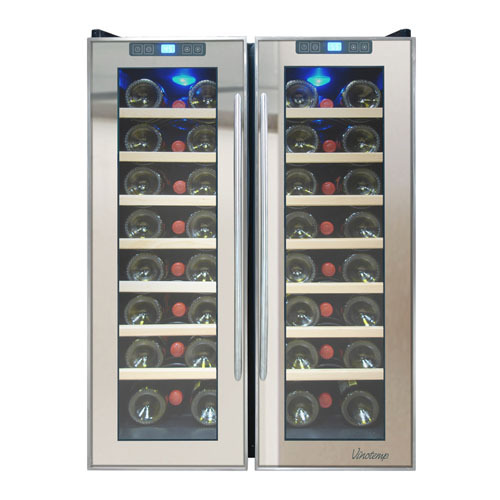 This energy efficiency will lead to less electricity usage and savings in energy bills throughout the years.Note: The Vinotemp 12 Bottle I-Cellar Wine Cooler (model: VT12TEDI) is designed for indoor use and should not be used outside or in garages. 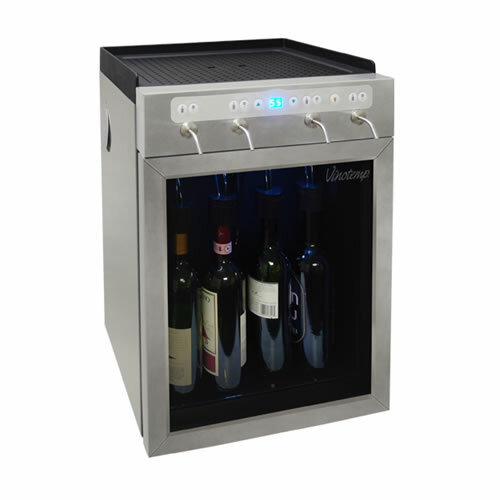 The Vinotemp 16 Bottle Wine Cooler (model: VT16TEDS) is perfect for small wine collections. 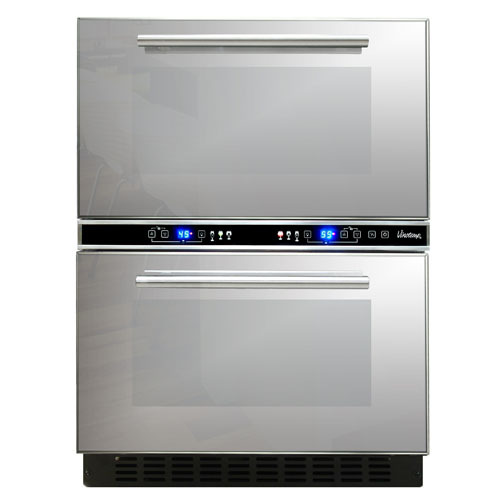 The black cabinet and stainless steel trimmed glass door highlights favorite selections. 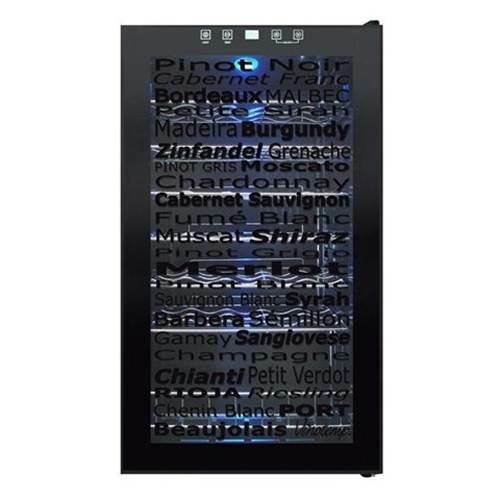 Part of the Eco Series of environmentally friendly, thermoelectric cooling units, this Vinotemp 16 Bottle Wine Refrigerator allows you to accurately control the temperature of your wine. 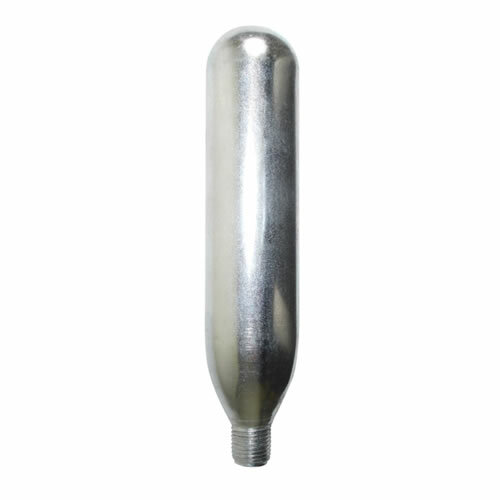 Also because of its thermo-electric cooling system, which involves very few moving parts, your wine will be protected from unnecessary vibration. Thermo-electric cooling is not only good for your valuable wine collection but also for the environment. Using absolutely no ozone depleting chemicals such as CFC's or HCFC's you will be sure that you are doing your part to preserve the environment. 3 slide-out wire shelves provide easy access to your bottle of choice while preventing the agitation of sediments in other aging wines while an angled bottom shelf presents your favorite varietals. 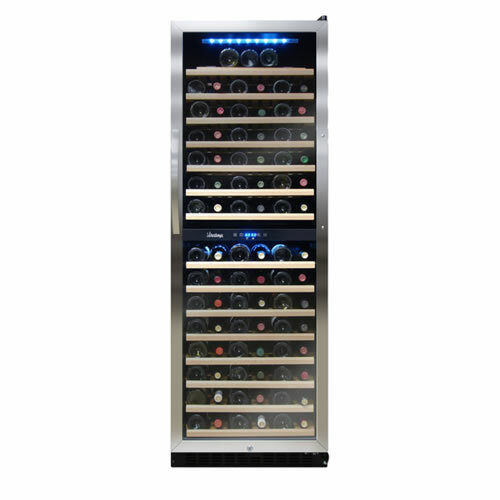 A touch digital control offers settings for red, white or sparkling wine, while the one-touch dual function electronic displays ease temperature monitoring. 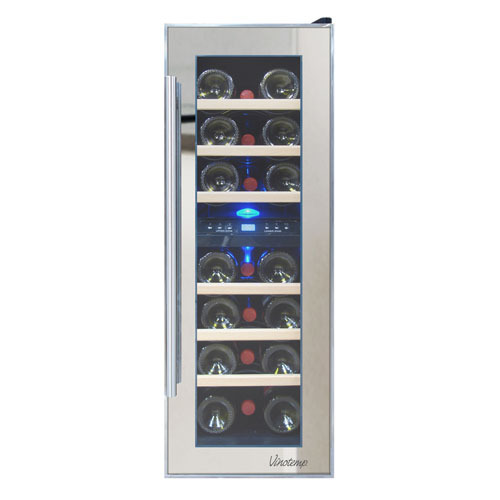 In addition, this wine cooler features auto defrost, interior light, and an elegant stainless steel door handle. 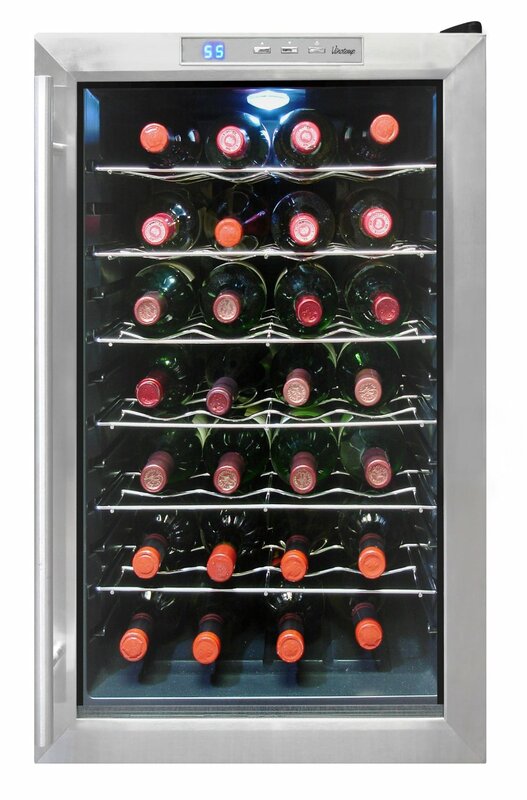 The VT-16TEDS wine cooling unit uses dual paned glass windows, a technology that has been proven in the construction industry. They have better insulation properties, better UV protection, and are easier to clean. 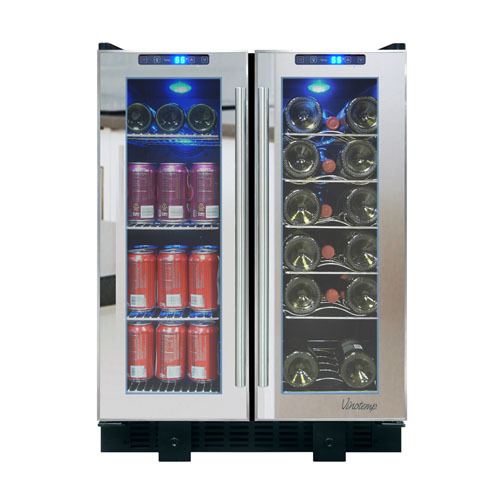 This energy efficiency will lead to less electricity usage and savings in energy bills throughout the years.Note: The Vinotemp 16 Bottle Wine Cooler (model: VT16TEDS) is designed for indoor use and should not be used outside or in garages. 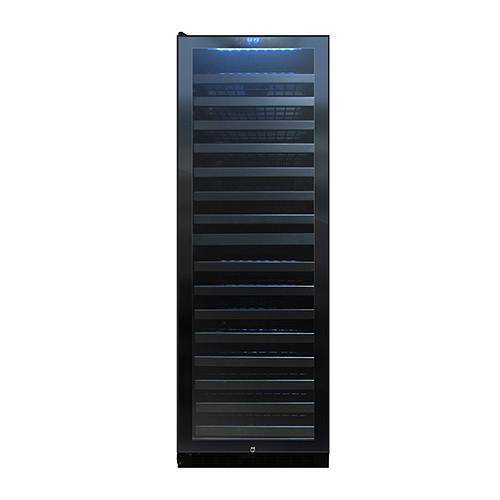 For those that already have or are looking to start a substantial wine collection, the Vinotemp 160 Bottle Wine Cellar (VT-188MSW, VT-188MBSH) has enough room to store all of your favorite wines and then some. With a total capacity of 160 standard 750 mL wine bottles, you have countless choices in how to store your collection across 15 adjustable gliding pull-out shelves with classic wood trim. The powerful compressor-type cooling system provides amazing cooling power throughout the entire cabinet and vents through the front, enabling built-in installation to save space in your home, restaurant, or bar. 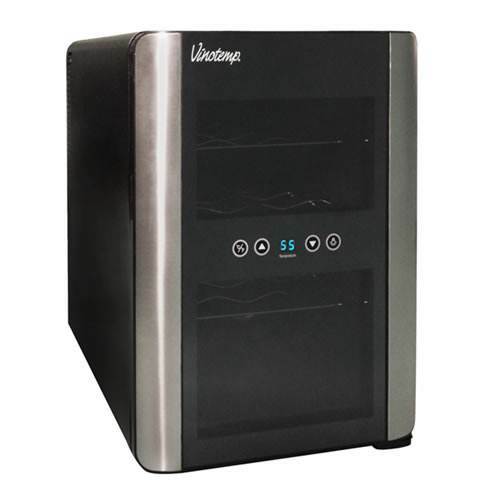 This Vinotemp wine cellar features multiple temperature zone capabilities that automatically adjust when you simply set the lowest desired temperature for your white wines. The digitally-controlled cooling system then creates the optimal temperatures for your red wine that requires a warmer storage climate. 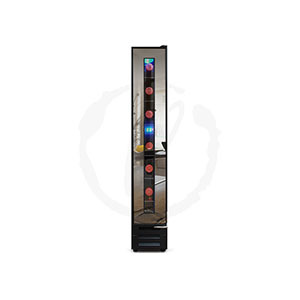 Choosing your temperature -- anywhere in a range from 48 degree-65 degreeF -- is extremely straightforward by use of the dual LED temperature display control panel conveniently located in the middle of the unit. 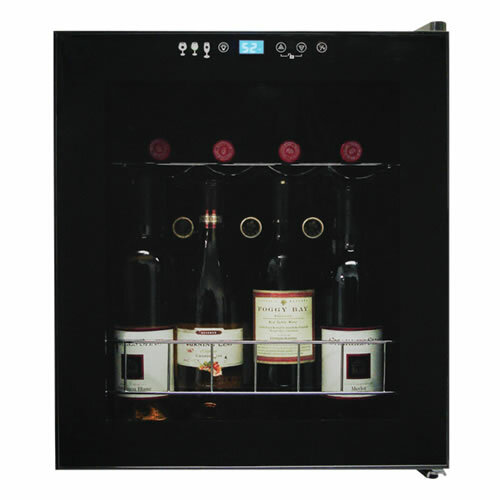 The insulated dual-paned glass door prevents the escape of cool air or warm air from entering the cabinet, and also has a built-in lock to protect your wine from unwanted visitors. The ample interior lighting helps you view your collection without opening the door, and also showcases your wine to admirers. Make the functional and stylish Vinotemp 160 Bottle Wine Cellar your single unit storage solution. Multi-Zone Cooling: Simply set the coldest desired temperature for your white wines, and the upper section of the cabinet will automatically create optimal temperatures throughout Built-In or Free-Standing Installation: The front-exhaust vent system eliminates the need for a buffer around the unit for venting, and the finished cabinet looks great as a standalone unit Digital Display: The dual LED temperature displays are centrally-mounted and feature a simple control interface to maximize ease-of-use Please Note: This item is delivered using White Glove Service. 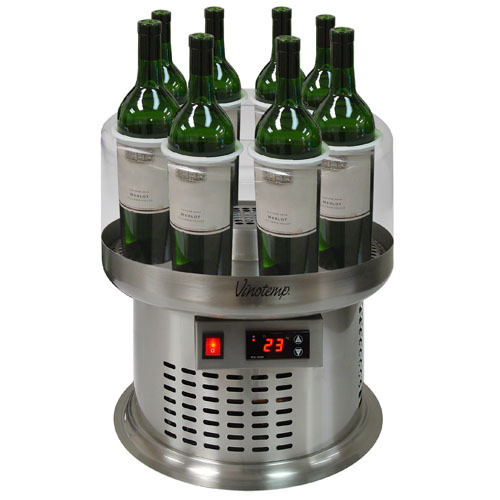 This 28 bottle unit can be placed on a table top or be free-standing to keep your wine at just the right temperature. 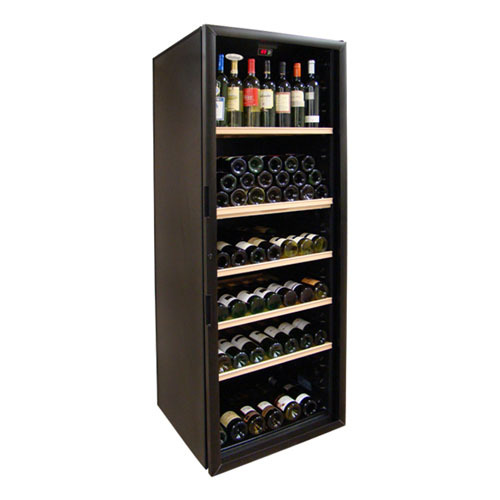 It features a black cabinet with stainless steel door trim and handle with a sturdy wire shelf racking system for individual bottle storage. Because of its thermo-electric cooling system which involves very few moving parts your wine will be protected from unnecessary vibration. Thermo-electric cooling is not only good for your valuable wine collection but also for the environment. Using absolutely no ozone-depleting chemicals such as CFCs or HCFCs you will be sure that you are doing your part to preserve the environment. 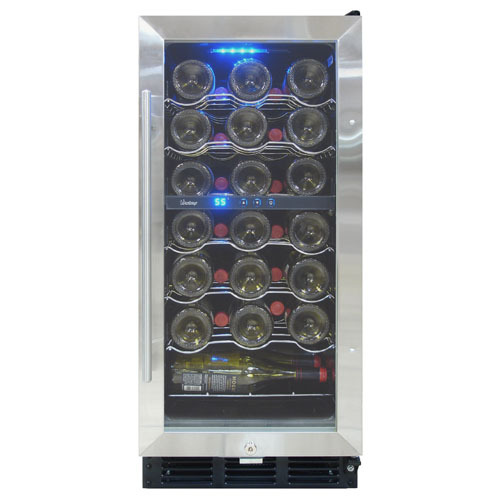 Let your wine collection thrive with the Vinotemp 7-Bottle Mirrored Wine Cooler (VT-7BMSL-FE) taking care of business in your home. 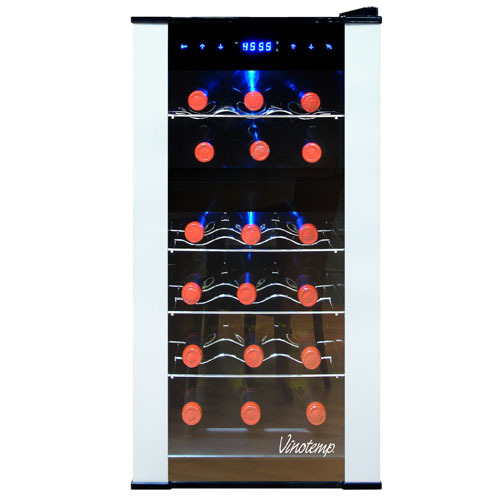 This wine cooler is prepared to hold up to 7 standard bottles of wine and operates like a dream with an intuitive touch screen control panel. It's ready to fit nearly anywhere with a slim profile designed for built-in or freestanding installation. With a striking modern style brought out by a Vinotemp-exclusive, patent-pending mirrored trim design, it even looks the part. 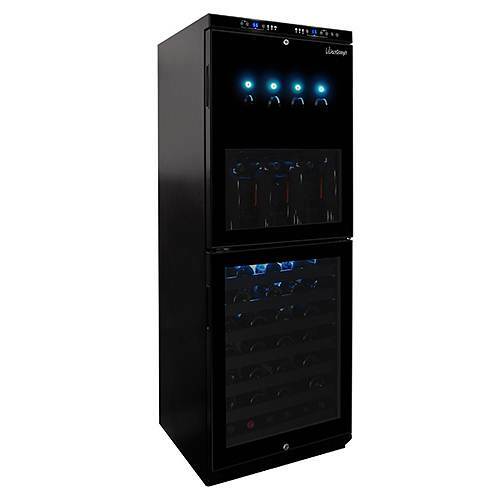 This wine cooler is sure to keep your collection at just the right temperature with a range between 40 degree and 72 degreeF and dual-pane glass door.Smart: This wine cooler is prepared to hold up to 7 standard bottles of wine and operates like a dream with an intuitive touch screen control panel.Sleek: With a sleek modern style, it is ready to fit in tight spaces with a slim design for built-in or freestanding installation.Reliable: This wine cooler is sure to keep your collection at just the right temperature with a range between 40 degree and 72 degreeF and dual-pane glass door. Add a beautiful piece of furniture to your home while also giving yourself the perfect storage space for your wine collection with the Vinotemp Cava 18-Bottle Dual-Zone Wine Cellar (VT-CAVA1). With two (2) zones that can function at two (2) different temperatures but both using thermoelectric cooling technology, you can store all of your wine in a prime environment. The storage drawer offers you the perfect place to store your wine bottle opener or corkscrew, and the pull-out serving tray gives you a place to lay out stemware, cheese or grapes when you have guests over. The dark brown exterior and brass finish handles ensure that this piece will look lovely in any room of your home. 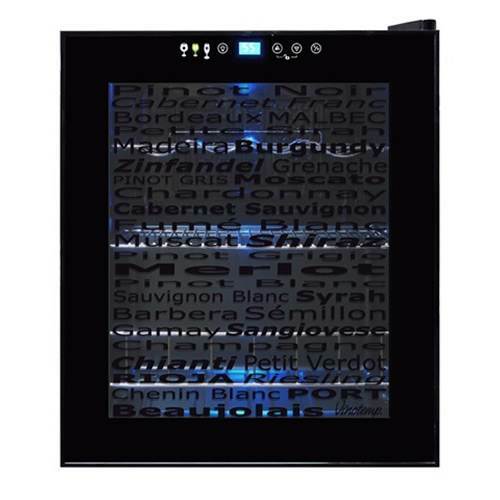 The thermal glass door and interior light illuminates your wine for an easy selection process. Dual-Zone: With two (2) zones that can function at two (2) different temperatures but both using thermoelectric cooling technology, you can store all of your wine in a prime environment Storage Drawer & Pull-Out Serving Tray: Offer you the perfect place to stow away wine bottle openers and display stemware or lay out grapes or cheese for guests Interior Light: The thermal glass door and interior light illuminates your wine for an easy selection process Please Note: This product will be delivered using White Glove Service. 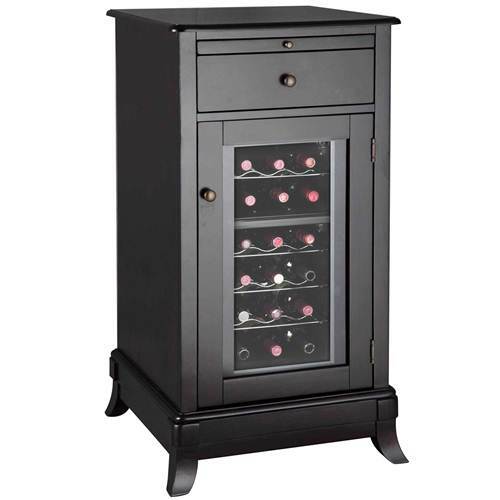 Add an elegant armoire to your home while simultaneously storing your prized wine collection with the Vinotemp Sonoma 180 Bottle Wine Cabinet (VINO-SONOMA180). The beautiful Cherry finish and decorative arched window cut give this wine cabinet its stylish appearance indicative of Vinotemp's Sonoma Series Collection. Store approximately 180 bottles of precious wine in the 3.5 inch cubicles viewable through the double paned glass door. 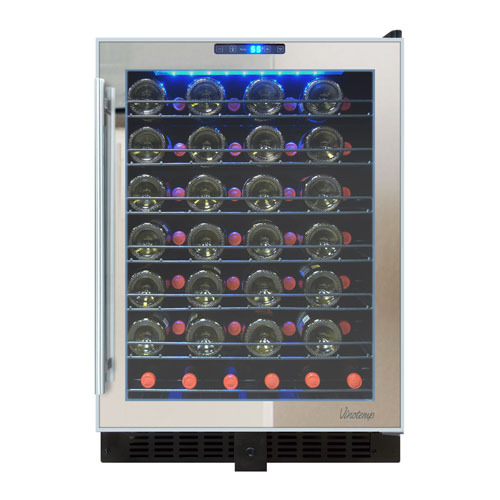 Set and adjust the integrated self-contained Wine-Mate cooling system using the easy-to-use digital temperature controls and display. 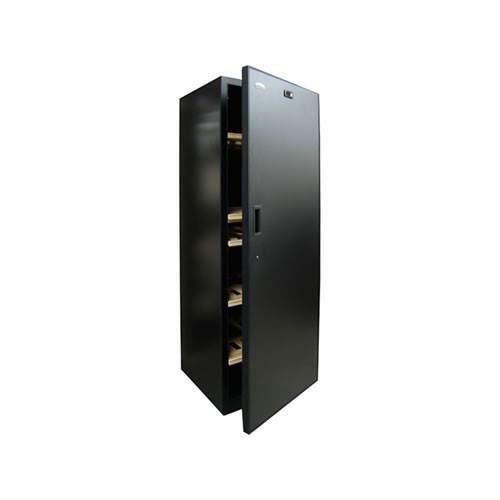 Confidently store and display your wine collection between 50-65 degreeF in this sophisticated wine cabinet. Elegant Style: The beautiful Cherry finish and decorative arched window cut on the double paned glass door both add to this wine cabinet's sophisticated look Bottle Capacity: Store approximately 180 bottles of wine in the 3.5 inch cubicles Cooling System: Using the self-contained Wine-Mate cooling unit, you can confidently store and display your wine collection between 50-65 degreeF Please Note: This product will be delivered using White Glove Service. Add an elegant piece of furniture to your home while simultaneously storing your prized wine collection with the Vinotemp Sonoma LUX 296-Model Wine Credenza (VINO-SONOMA296L). 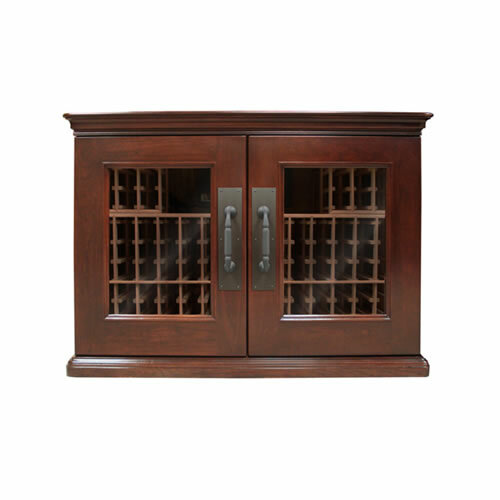 The beautiful Cherry finish and decorative cornice and base give this wine cabinet its stylish appearance indicative of Vinotemp's Sonoma Series Collection. Store approximately 192 bottles of precious wine in the 3.5 inch cubicles viewable through the french glass doors with charming handles. 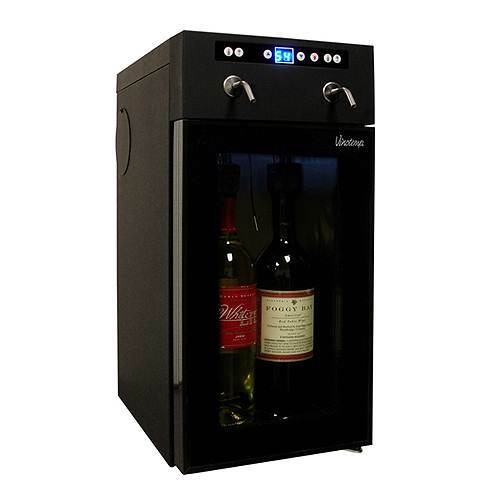 Set and adjust the integrated self-contained Wine-Mate cooling system using the easy-to-use digital temperature controls and display. 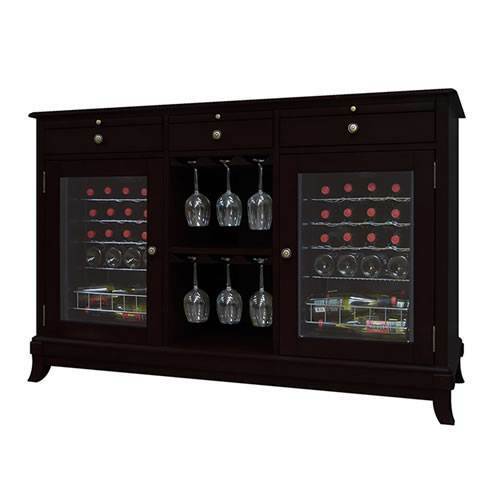 Confidently store and display your wine collection between 50-65 degreeF in this sophisticated wine credenza. Elegant Style: The beautiful Cherry finish, decorative cornice and base, glass french doors and charming handles all add to this wine credenza's sophisticated look Bottle Capacity: Store approximately 192 bottles of wine in the 3.5 inch cubicles Cooling System: Using the self-contained Wine-Mate cooling unit, you can confidently store and display your wine collection between 50-65 degreeF Please Note: This product will be delivered using White Glove Service.